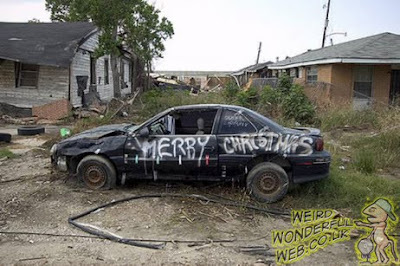 Weird Wonderful Web: Christmas parking tip! Car nicely decorated for Christmas - no expense spared spent! It has to be said, that one of the worst parts about Christmas is the endless traipsing around all the shops and giant malls looking for those 'perfect gifts'. But even worse than THAT! is trying to park in these damn places, without getting into a festive fight or having to park so far away you're almost in a different time zone. Well, to make things a little easier, these guys have come up with an ingenious solution. Make vertigo go go go! Butter your bread with a stick!